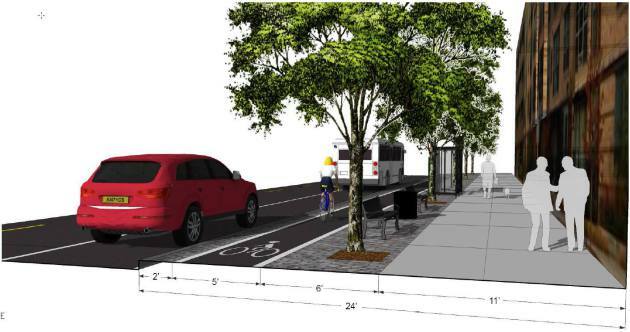 Minneapolis is getting another of the protected bike lanes known as a cycle track under a Hennepin County revamping of Washington Avenue in downtown that gives bikers dedicated space and walkers wider areas at the expense of motorists. The cycle track won't be built until 2015, when the county reconstructs Washington between Hennepin and 5th avenues. The track will be built on either side of the street at the level of the top of the curb. Each side will be one-way and five feet wide, with a two-footbuffer from the street. The design later will be extended east on Washington to Interstate 35W, but bike lanes will be striped from 5th to 35W until the cycle tracks are extended. The approval of the design Tuesday by the Hennepin County Board caps a long campaign in which the Minneapolis Bicycle Coalition collected more than 500 letters from residents asking for pedestrian and bike improvements on Washington. The proposal now goes to the City Council for municipal consent. Hennepin County Commissioner Peter McLaughlin hailed the new design as making Washington less of a barrier between downtown and the riverfront. 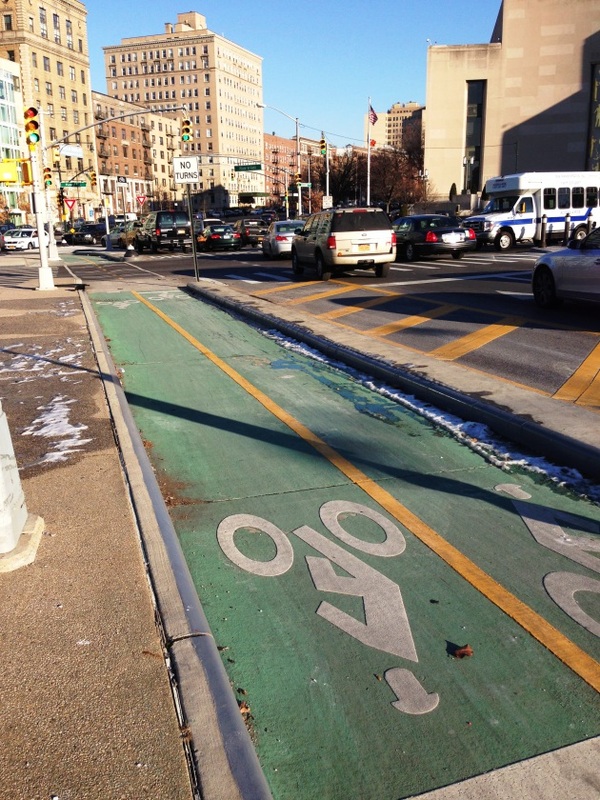 Advocates for cycle tracks argue that the protection provided by a curb or bollards, rather than mere painted lines, will encourage bike use by those intimidated by sharing traffic lanes with cars. It's not the first cycle track in Minneapolis, despite some claims. It's likely that the city will build one or more such tracks next year before the county project gets under construction, according to bike planner Shaun Murphy. There's already a three-block section of cycle track running along the light-rail line on Washington by the University of Minnesota campus. Bike lanes on Hennepin and 1st avenues are protected for some parts of the day by parked cars but only intermittently for some downtown blocks. Another raised bike lane exists in the Hennepin-Lyndale bottleneck south of Loring Park, but doesn't separate bikes and pedestrians. But a cycle track proposal for a portion of Minnehaha Avenue was shot down by Hennepin County staff in favor of bike lanes. Ethan Fawley, the coalition's executive director, said that the redesigned Washington Avenue is significant for pedestrians as well because the width of sidewalk and planted area will increase by one-quarter to one-third, depending on location. The distance that pedestrians must cross on Washington will be cut by a similar amount, he said. Drivers will have four through lanes on Washington rather than six but that will partially be offset by added turn lane space. The county's traffic forecast is that rush hour travel times will increase by 30 seconds eastbound and increase by three minutes westbound by 2035 between 35W and Hennepin. That's with a forecast 12 percent increase in traffic over that period. Some current traffic making a left turn from eastbound Washington to northbound 35W would be diverted to a long-planned ramp to be built connecting S. 4th Street to northbound 35W. That project is scheduled for 2014.